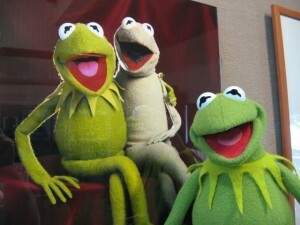 Today is the first of my “Flashback” blog posts. I’ll be doing these to fill in on weeks I had to stay at home. This one is a “Frog Flashback”. Back in 2007, my friend Kevin Williams had a special guest come stay with him in Memphis for a week- Kermit The Frog! 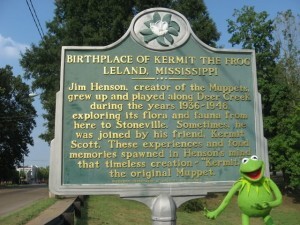 Master Replicas had sent Kermit out on a tour of the US as a Muppet ambassador and one of the stops was Memphis, TN. 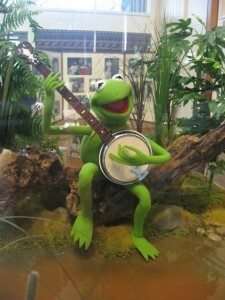 We took Kermit around the river city- Beale Street, Stax, Graceland, the National Civil Rights Museum, and the Memphis Botanical Gardens were a few of our stops. But we knew there was one place he would love to see- home. 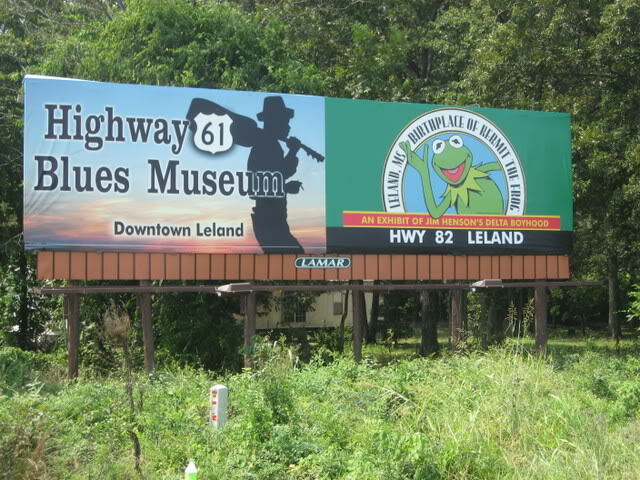 One Saturday in September, myself and members of the Mid-South Cartoonists Association (Martheus and Janet Wade, Kevin, and Muley The Mule) spent the day traveling down HWY 61 into Mississippi with Kermit. 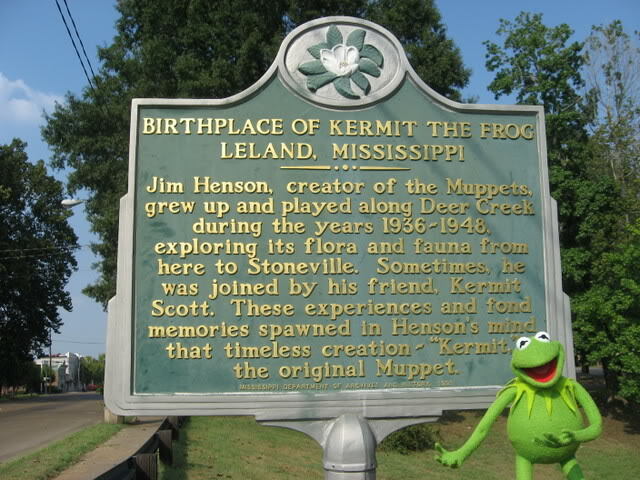 As we drove I told the group, “Other folks can take Kermit anywhere in the world, but we’re taking him home!” We passed the sign for Leland, MS and got excited- we were going to the birthplace of Jim Henson and Kermit The Frog. Once in Leland, we got to visit the Jim Henson Boyhood Museum which is located right on the banks of Deer Creek. This was the place Jim would swim and fish as a boy growing up in Mississippi. 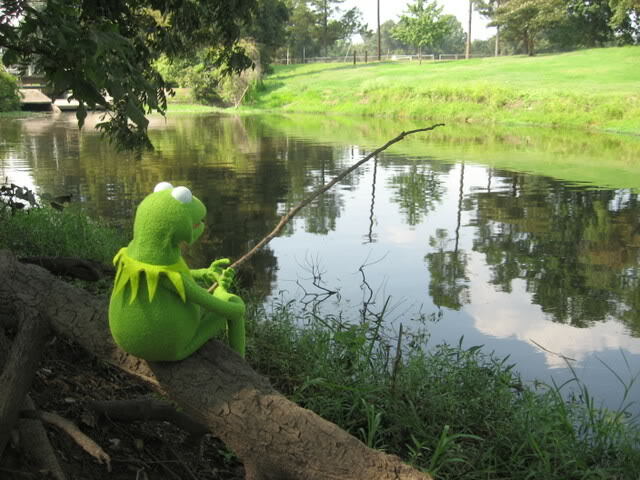 We saw some fish and a few turtles swimming up and down the creek. 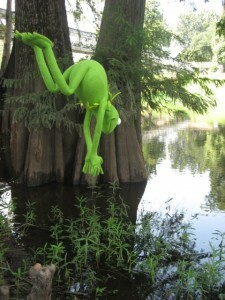 We had to keep an eye on Kermit- he jumped at the first opportunity to go for a swim as well! 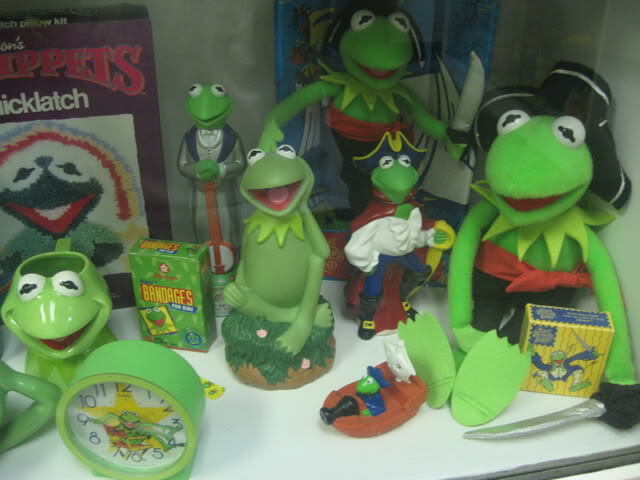 Once inside the museum, we met some great local ladies who toad- I mean, “told” us more about Jim Henson and the history of Leland. It was a small space, but jam packed with photos, collectibles, exhibits (including “The Song of the Cloud Forest” from The Jim Henson Hour in May of 1989), and even a video viewing area and a gift shop. We asked a lot of questions, took a lot of photos, watched some TV, read old news clippings, and did a lot of shopping! Some of the exhibits were on loan from The Jim Henson Legacy and we felt incredibly lucky to view them up close- and pretty much to ourselves while we were there. 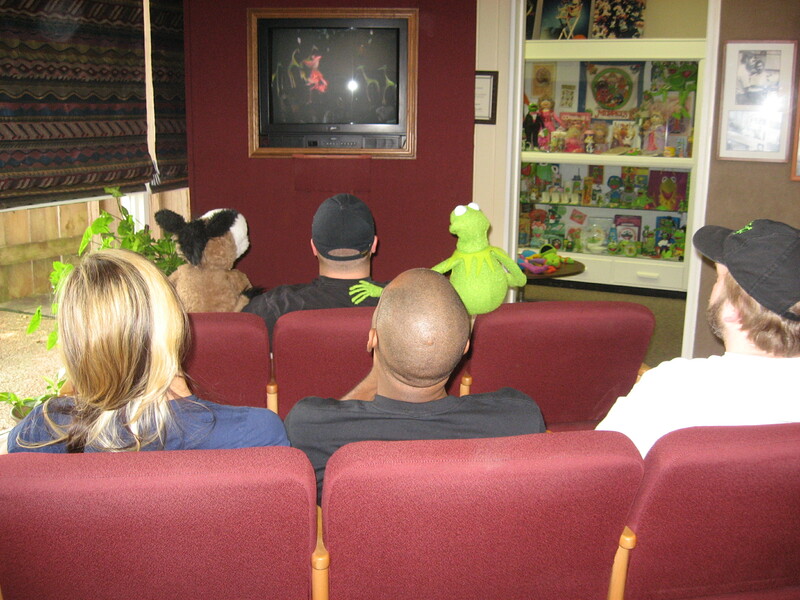 Occasionally a family or two would come in and look around, but for much of our visit it was just us, Kermit, and the ladies who worked there. We hated to leave the museum, but it was getting late and we wanted to check out more of the town, historic markers, Jim’s old high school, and Deer Creek. Around Christmas they have a parade down Deer Creek with floats that actually float! 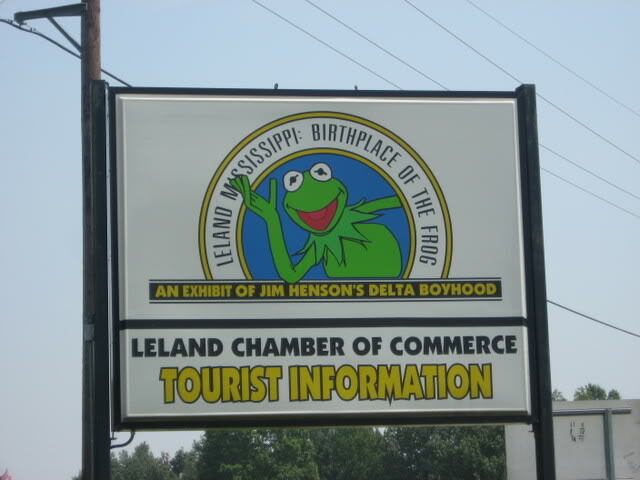 On Saturday, September 24, 2011 the town will be celebrating the Leland Frog Fest, which would have been Jim’s 75th birthday. 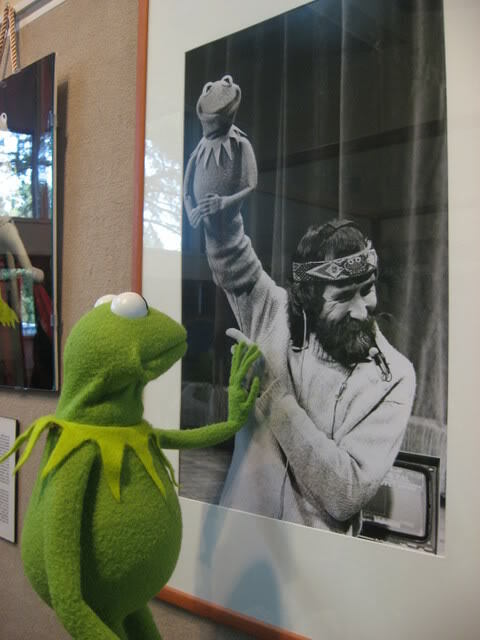 It is also an arts festival, the 20th Anniversary Celebration of The Jim Henson Delta Boyhood Exhibit, and a dedication of the Rainbow Connection Bridge in honor of Jim Henson. 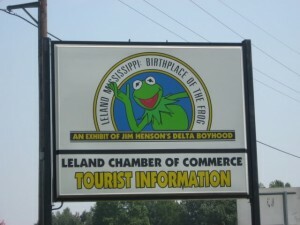 Leland, MS is “toad-ally” a Muppet fan’s dream trip! 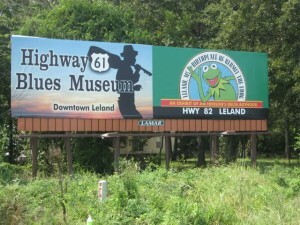 Have Geek Will Travel - Leland Frog Fest- just a hop, skip and a jump down Hwy 61! Your photo of Kermit touching the photo of Jim & Kermit is touching and beautiful. Would you make the full-sized image available for download? I for one would love a copy.